The Van Allen Probes mission has revealed a third radiation belt encircling Earth, dispelling a long-held theory that only two of these hazardous charged particle layers exist in Earth’s magnetic field. This discovery is based on data collected from the LASP-built Relativistic Electron-Proton Telescope (REPT) experiment, published today in the journal Science online, at the Science Express website. A televised NASA press conference held at 12 noon MST featured LASP Director and lead author of the report, Dan Baker. The twin Van Allen Probes satellites were launched in August 2012 to study the dynamics of Earth’s radiation belts and improve scientists’ ability to predict space weather. From September 1 to early October, 2012, the mission’s REPT sensors returned data that signified the emergence of a previously unseen middle belt, or “storage ring” of charged particles. The emergence was associated with a powerful electron acceleration event within the belts during this time. On October 1, 2012, the new storage ring disappeared abruptly, most likely related to changes in the solar wind and a geomagnetic storm. Earth’s belts are made up of trapped, highly energetic protons and electrons that can damage sensitive spacecraft electronics—including those responsible for weather monitoring and prediction, navigation, and communications—and that can harm astronauts passing through the belts during manned missions. The LASP-built REPT instruments measure the intensity, acceleration, number, and direction of these radiation particles. 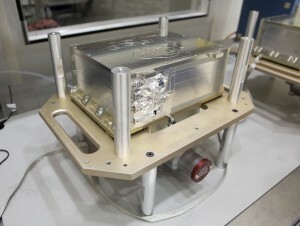 For more information on the Van Allen Probes mission, previously known as the Radiation Belt Storm Probes (RBSP) mission, please visit http://lasp.colorado.edu/home/missions-projects/quick-facts-rbsp/.